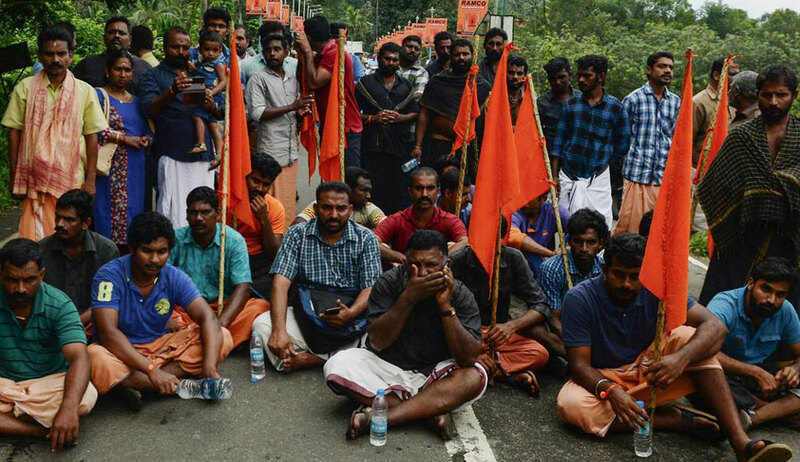 In the midst of ongoing protests against entry of women of all age groups into Sabarimala temple, two women from Kerala have approached Attorney General of India seeking sanction to initiate contempt proceedings against a few people allegedly violating the Supreme Court’s judgment in Indian Young Lawyers Association v. State of Kerala & Ors. One of the petitions has been filed by one AV Varsha alleging contempt of court by Mr. Kantararu Rajeevaru, Head Priest of Sabarimala Temple in Kerala, and Mr. P. Ramavarma Raja, Chairman of Trust/Committee that manages the affairs of Pandalam Palace that claims to have historical connection to the Sabarimala Temple and its affairs. It relies on media reports to allege that soon after the verdict, Mr. Raja wrote a letter to Mr. Rajeevaru, directing him to shut down the temple in case of any breach of rituals. Notably, both the individuals had taken a stand against entry of women before the Supreme Court. The writing of the letter now, the petition contends, is a clear violation of the Supreme Court judgment. “It is submitted that the ingredients of a criminal contempt are clearly met as per Section 2(c) of the Contempt of Courts Act, 1971 as there is clear case of scandalizing and lowering of authority of this Hon’ble Court by interfering and obstructing with the administration of justice by resisting the implementation of judgment of this Hon’ble Court. Therefore, it is submitted that the conduct and actions of the Contemnors are acts of criminal contempt of court, punishable under Section 12 of the Contempt of Courts Act, 1971,” the petition asserts. Another petition has been filed by a woman lawyer from Thiruvananthapuram, Geena Kumary against Adv. P.S Sreedharan Pillai, President of the State Committee of Bhartiya Janta Party; Adv. Muraleedharan Unnithan K.G, leader of the Bhartiya Janata Party in Pathanamthitta District, Kerala; and Mr. Kollam Thulasi, a movie artist. It is stated that the contemnors have been orchestrating various marches, rallies, social media campaigns wherein calls and speeches are made by the contemnors to resist implementation of the judgment of the Supreme Court. Mr. P.S Sreedharan Pillai is stated to have organized a thousand-strong mob at Nilakkal and nearby areas at the foothill of Sabarimala on 17.10.2018 by attacking the public property and by stopping vehicles that crossed through the road and by attacking women devotees who had arrived to visit Sabarimala. The contempt petition further states Mr. Kollam Thulasi made highly contumacious remarks by saying that women should be ripped apart; one half should be sent to Delhi and another to the Kerala Chief Minister. According to the petitioner, this is directly in the form of resisting the implementation judgment of the Supreme Court. Mr. Muraleedharan Unnithan is indicted for saying in a protest march against the judgment that the Constitution should be burned to ground. The petition is pending consideration of Attorney General for India as he is required to provide consent before the contempt petition can be filed in the Supreme Court, as per Part II Section 3(c) of Rules to Regulate Proceedings for Contempt of the Supreme Court, 1975.